--Poet Hart Crane, writing about the Brooklyn Bridge, which turned 125 yesterday. To learn more about the bridge, which urban critic Lewis Mumford once called "the most completely satisfying structure of any kind," go here. But to really experience it, I would heartily suggest that you go there, and see it for yourself. I heard it's for sale? Such power and beauty in words. The poetry is a bridge of great depth and breadth as well. Thanks. And by the way, if you can't get to New York this summer--where I would suggest walking the bridge at daybreak--you might want to travel half the distance to Cincinnati, where there's a bridge that looks an awful lot like a smaller version of its more famous cousin in New York. And that's no coincidence, because they have the same designer/builder/engineer, John Roebling. This bridge was completed even earlier, just one year after the American Civil War ended. I might go to Cincinnati and look for this wonder. But I do love the way that Joseph Stella depicted the bridge with a definite religious resonance. I do hope you make it to Cincy. If you get there, be sure to also check out the Underground Railroad museum (link below), which the bridge directly empties into (it's a fitting metaphor for how many slaves escaped from the south by swimming across the Ohio River, a boundary between southern and northern states). It's one of the more interesting and unusual museums in the country. Anyway, please let us know how the trip goes if you do make it. Like the man said, if you've never been there, Go there. I couldn't agree more, John. Nice photo, TJ. In addition to wielding a mean pen, you cradle a mean camera. I envy you for that. So what's the closest equivalent to the Brooklyn Bridge in LA? Not necessarily a bridge, of course, but what's the most beloved built structure? Could it be something as prosaic as the Hollywood sign? And how about the same for your native Detroit, by the way? Those Pistons looked pretty good last night, too, didn't they? We just might get a Lakers vs. Pistons finals this year. Sigh ... Much as some people might say Los Angeles City Hall is a beloved structure, I'd have to disagree. (Can you close your eyes and picture LA's City Hall? Didn't think so. I doubt most of LA could either.) Although, that Disney Hall gets a helluva lot of attention, and it's damned beautiful, there's still a lot of people around the world who've never heard of it. Maybe that will change. As you say, the Hollywoodland sign, minus the "land," of course, is definitely beloved. And, how fitting is it that a sign advertising real estate for sale has become the one thing everyone thinks of when they think of LA? Not that I don't like it. I do. God help anyone who tries to harm it, block my view of it, or take it away. But, it's just impossible to match a sign with something like the Golden Gate Bridge, or, gulp, the Brooklyn Bridge, which took decades to build and cost many men's lives. Give us a few years though. I think the Disney Hall is going to become more and more of an LA icon. Detroit? Hmm... Personally, I love Hitsville, USA. But, I also really like the Michigan Central Station, which the last time I was back that way looked as though it had been left to rot, the windows punched through, one gigantic concrete-and-steel cheese grater straining the bad air. (There's some sad photos of the station at this link.) Then there's the Ford River Rouge plant, which somehow manages to make it into the credit sequence of every movie that uses Motown as a backdrop. Thank you Beverly Hills Cop ... Action Jackson ... etc... ugh. 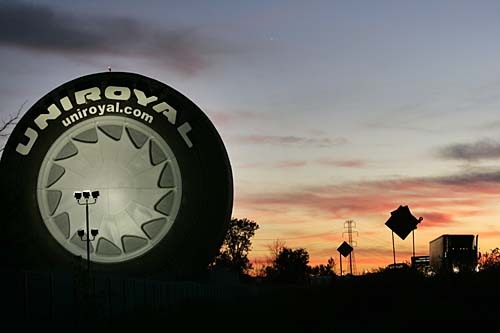 Then there's the giant UNIROYAL Tire on I-94. Or maybe the Ambassador Bridge, which takes you to beautiful Windsor, Ontario, Canada. (Love Windsor) The Ren Cen is the easy choice, since they seem to put some version of it on EVERY little stinkin' official thing I ever seem to see about Detroit. I don't know what they've done, or plan to do with Tiger Stadium, but that's beloved for sure, or it was when I was there. Or, maybe Diego Rivera's mural at the Detroit Institute of Arts. Does a mural inside a building count? Oh, and what about the Detroit-Windsor Tunnel? There's two of them. The Michigan Central Railway Tunnel completed in 1910, last I heard, is still in use [my inner child says "kew-el."] Hmm. This is the second Detroit question you've asked me and ... I don't know. Detroit's a hard one. Wow, that's a pretty good overview, for which we thank you. How could I forget about the Gehry masterpiece, Disney Hall. We have a similar ribboned titanium design in the Weatherhead School of Management building here in Cleveland, except that it was unfortunately shoehorned into a tiny wedge of land, and thus operates at a visual disadvantage. As for Tiger Stadium in Detroit, the NYTimes just ran a piece a couple weeks ago about the struggle to keep it from the wrecking ball. The photo of dandelions choking the outfield is pretty jarring. How sad the way we treat iconic structures in this country. Wow. Thanks for the heads up on the NYT piece. Dandelions in the Outfield. Sounds like the title of a very sad book. Also, as I was surfing around yesterday looking for images of beloved buildings in Detroit, I found a Web site dedicated solely to photographs of abandoned Motown structures [inner child says "kew-el" again]. It's called ForgottenDetroit.com. Check out the pics of Michigan Central. Sad stuff. That would be a great (if also sad) title, wouldn't it? And here's hoping that Forgotten Detroit site is only temporarily down, because that's a great idea. It reminds me of a couple of great coffee table books I own, Lost Chicago and Lost New York, which contain evocative photos of iconic structures that no longer exist in each town. And I'm glad you finally got to see that piece on Tiger Stadium, because I meant to send it to you, and simply forgot. I noticed that it was down right after I posted it and checked the link, then I tried it again just now and it was back up. Musta been a virtual burp. Excellent. It is an interesting site. I'm glad to see it includes the old Book-Cadillac Hotel, which is now being rehabbed back to its former glory by...a Cleveland developer, of all things. The Wall Street Journal had a great front page treatment of it some months ago. They painted a picture of the kind of bustling place full of so much energy that you just wanted to be there. Of course, it's impossible to return the kind of energy to downtown Detroit that it had 70 years ago, but as an architect's son, I think restoring an iconic building isn't a bad way to at least do what we can.